A GPS (Global Positioning System) helps you find unknown locations. It is an essential fishing device whether you are a beginner angler or a veteran. The GPS will help you on any fishing expedition be it deep sea fishing or shore fishing. It helps you to know where you are (current location) by coordinates. It also helps you to locate your favorite fishing spots using specific coordinates because the terrain of your fishing spot is hidden under the water. In addition, it helps you to get back to the shoreline. The GPS maps on your smartphone have shortcomings as far as fishing is concerned. A handheld GPS allows you to mark best fishing spots, and use it for other functions which a smartphone can’t do. A handheld GPS will monitor your trolling speed and detail the weather and temperature while fishing. Anglers can use handheld GPS as a backup to other navigational systems or chart plotters. Here are a few crucial details on how to use a handheld GPS for fishing. A GPS has incredible mapping features. When buying a GPS, purchase one designed specifically for fishing. 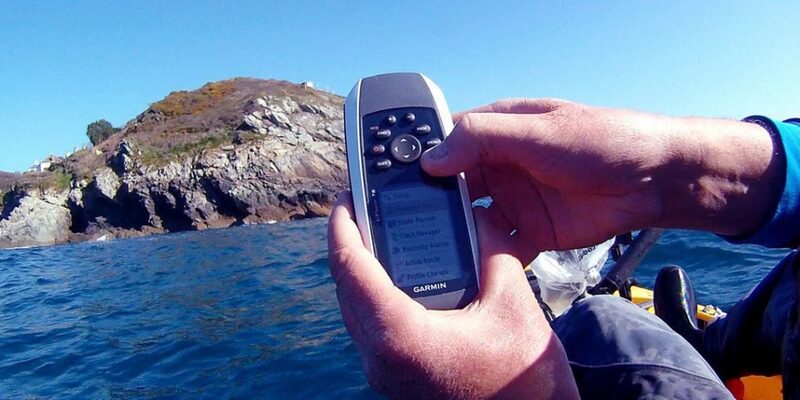 The advantage of purchasing a marine GPS is because it comes already loaded with marine maps. Marine maps show water depths and other important features to anglers. Therefore ensure that your GPS can display maps to help you navigate quickly. You need a GPS with enough memory space for saving all your fishing data including waypoints and maps. Make sure that the GPS is small enough to fit in your hands and light enough not to cause hand fatigue. In addition, consider buying a GPS with a barometer feature to help keep track of the weather. Another important feature of a GPS is an electronic compass which indicates the direction you are facing when you are standing still. Also, a GPS with a wireless data transfer feature has an added advantage of helping you share data easily. In addition, your GPS needs to be waterproof and durable. It should be able to withstand being carried around in the tackle box. Buying a GPS with preloaded maps is a good idea, but you can always get maps online and load them onto the GPS. Also loading maps on a microSD card or CD can help you if you have many GPS units. So that all you have to do is to carry the CD or microSD on any fishing trip to use on the GPS at hand. After purchasing your GPS, check the maps features. If your GPS has no maps, then you need to connect it to a computer so that you can load maps on the GPS memory. Your GPS has a system of connecting it to a computer. Check the manual on how to do this. Then connect it to a computer and load the maps that you require for fishing. Get to know how the GPS functions before you use it on a fishing expedition. Turn it on and start practising by marking waypoints of places you already know in your neighborhood. A waypoint is an important location. Then use the GPS to return to the waypoint. The GPS user manual should guide you on how to do this well. Before you identify your favorite fishing spots, check for best fishing spots online or get the information from other anglers. You can also get hot spots from a tackle shop. Enter the coordinates in your GPS and save them. Start by marking your starting point so that you can find your way back home easily. Mark all important features. Mark your home and also mark the shoreline. Then mark underwater features and anywhere you catch fish. Use icons on your GPS to do this. Marking a body of water using your GPS will help you master that body of water. Remember to combine the information with other important fishing information including trolling speed, time of day, weather, water depth and temperature. Most GPS’s have a big memory. You can, therefore, map up to 500 waypoints. While fishing, anytime you catch a fish that should be marked as a waypoint. Remember to take down notes immediately after hitting a hot spot. Record what type of fish you caught, weather conditions, the bait you used and other information. This will help you in your future fishing expeditions. You will be able to return to that particular spot easily. Whenever you catch a fish, mark the spot and stay in that spot and concentrate on fishing there and see if you will be able to find more fish. Your GPS has a facility for marking various water spots and fishing spots. You can mark a spot as a favorite, bookmark, waypoint, water depth, underwater features etc. Your GPS will allow you to locate the latitude, longitude, time, date and there is a portion for writing comments. Also, check fishing possibilities around you. Though you may not have caught a fish at a particular spot, there are other indicators of a potential fishing hot spot. If you see other anglers catching fish, mark the area, and make notes about the location. Such points are good reference points for future fishing trips. Also, use the zoom-in features and breadcrumbs features in your handheld GPS to enhance your fishing experience. Sharing information about fishing adventures is easy because of GPS features. Share coordinates of hot spots in the water body where you were angling. You can share the information with fellow anglers and get valuable fishing information from them too. A GPS will enhance your fishing experience by helping you locate the best fishing spots and also helping you to know your way around the waters. It is especially important if you are exploring new waters. Keep your GPS safely on a lanyard because they don’t float. Remember to have enough spare batteries for your GPS in your tackle box. If your GPS is not waterproof, you can wrap it in a sealed bag to protect it. For your safety, it is also important to know how you can navigate without a GPS in case it fails. If this happens and you don’t know your way back, ask fellow anglers for direction or follow other boats.